A light tube (aka Sun tube, Sun pipe, or tubular skylight) is a tube or pipe used to transport daylight from the exterior of a building to a room with no windows. This passive lighting device uses zero electricity and therefore is not responsible for any carbon emissions in use. Natural daylight is much easier on the eye than artificial lighting, and it can help reduce the effects of seasonal affective disorder. 3. diffuser. The diffuser spreads the light from the tube around the room to be lit preventing hot spots(a problem of traditional skylights) from occuring. 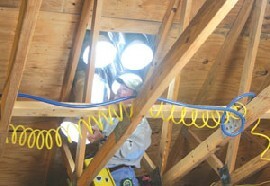 Typically a sun tube will lose 5-6% per metre of length the light must travel, and 10-15% for each 45 degree elbow required to get the light from the roof to room. An excellent guide to putting together a DIY Sun Tube System is available by clicking here. 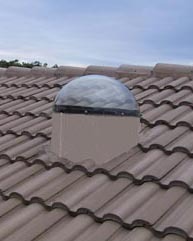 This Extreme How-To article is based around commercial Sun-Tek tubular skylight kits. Click here for the official Sun-Tek Tube fitting instructions. Prices for installation of a single light tube system in the UK start at around £500, increasing if tube extensions are required due to the roof being far away from the room to be lit. A combined natural light and ventilation system for a bathroom would typically cost £1000-£1,500 installed. Huge savings can be made if you are able to install the system yourself since the component parts are available from as little as £200 for a complete single tube system. SolarLighting Ltd – sole distributor in UK and Ireland for Solatube – one of the World’s leading solar lighting manufacturers. Moondraught – provide domestic and commercial sunpipes, and their MonoVent and SolaVent ventilation/sunpipe products.